With an enormous amount of professional and social pressure, combined with no time to eat or take a pause, for most industry professionals, fashion week is synonymous with stress, colds and anxiety. It's no secret that mental health issues are a serious concern within the industry, and The Psychology of Fashion is aiming to implement strategies to offset its effects during vulnerable times. For this New York Fashion Week, we've partnered with luxury wellness center Modrn Sanctuary in NoMad to offer 25% off a series of treatments to help beat the stress, anxiety and imbalance that can occur during fashion week. The initiative provides New York Fashion Week participants with 25% off five treatments: the Himalayan Salt Room, Somadome Meditation Pod, Private Infrared Sauna Room, and Sensory 7 Treatment – all therapeutic treatments which work to recenter, calm and decrease anxiety. To round out the NYFW offer with a beauty-focused option, the Cryo Treatment can spot-reduce up to half an inch of fat after a session. Here's a bit more about each treatment part of the NYFW offer. The Somadome is a meditation pod that creatively combines light therapy, binaural beats and meditations to produce several unique sessions aligned with what your intention is. Experience deep relaxation, the free-flow of energy, a place for your mind to solve problems, quiet down, or release stress. A Somadome session lasts twenty minutes and works to alter your brain waves and reprogram your thoughts. Users can choose guided meditation programs that span Physical Wellness (Fit, Heal, Recharge, Relax, Snooze), Mental Performance (Accomplish, Create, Focus, Overcome, Succeed), Going Inward (Ascend, Aspire, Bliss, Clarity, Confidence), and Attract Intentions (Achieve, Love, Manifest, Prosper, Reclaim). 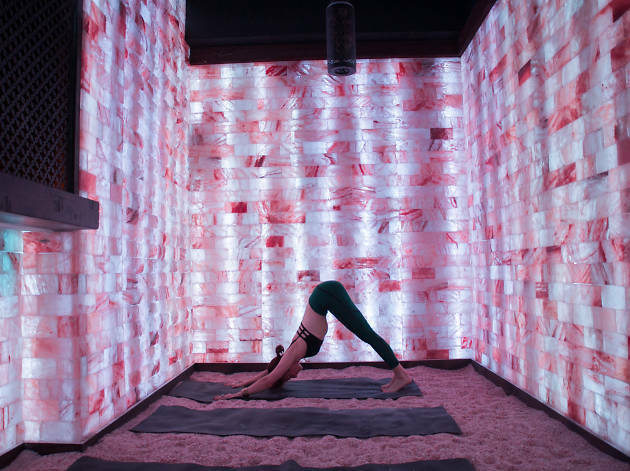 Inside the salt room, large slabs of lit pink salt line the walls, while tiny grains gently massage the soles of your feet. The salt creates an atmosphere that is rich in negative ions, just like being at sea, and draws out impurities. Salt therapy, also called halotherapy, is a holistic method that reproduces the natural micro climate of a salt cave by dispersing saline aerosol in a high concentration in a room whose surfaces are covered with layers of salt. Pink salt has been known to have incredible health benefits including enhancing the immune system, increased energy and alertness, increased focus and concentration, reduced susceptibility to colds and flu, increased lung capacity, relief from migraine headachess, sinus infections, allergies and hay fever, as well as the reduction in the severity of asthma attacks. Modrn Sanctuary's unique infrared sauna boasts eight carbon-fiber infrared heaters, a floor lined with himalayan salt that releases negative ions, an infrared foot warmer, an oxygen ionizer system to keep the sauna clean, dual wall construction for better heat insulation, and is equipped with a digital control that allows you to control the temperature, color focus and music of your session. Modrn Sanctuary's infrared sauna is lined with himalayan salt that release negative ions. Infrared saunas have been known to help with weight loss, detox, calorie burn, anti-aging, relaxation, oxygenation, pain relief, stress release and general health. Working on the chakras, the Sensory 7 is an immersive experience that combines seven healing modalities into one treatment for rapid rejuvenation. 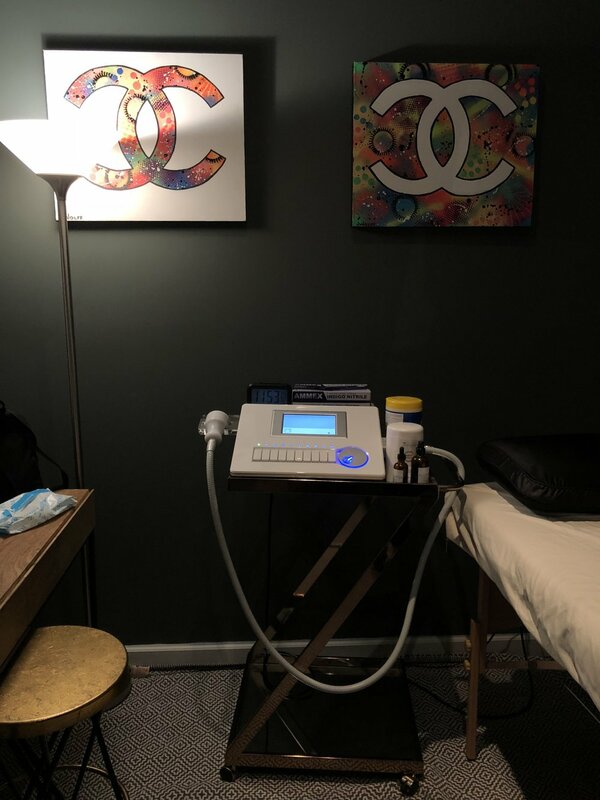 The seven modalities used are binaural beats, vibration therapy, quartz crystals, frequency generator, LED lights and color therapy, magnetic therapy, and an infrared biomat. We tried it, and it's the first time in a while that we can say we really felt calm. Binaural beats are sounds played at two specific frequencies that have been shown to organize brain waves and balance the mind. There are two transducers built into the biomat underneath you. These transducers create a vibration that plays along with the binaural beats, opening the body to heal and realign. Then, seven Vogel-cut quartz crystals receive the frequencies produced by our frequency generator. The UV laser and magnetic energy from the coil in the holder cancel each other out once they interact, this is how scalar energy is generated. What is left in its place is the scalar energy field, it is then focused through the Vogel-cut crystals and into the energy vortexes/chakras. The machine produces frequencies. Everything has a frequency. The earth has a frequency, every illness has a frequency, even we have frequencies that can all be measured. The generator can produce frequencies that will harmonize the body. Thereby, allowing for a healing environment within you and cellular rejuvenation. Then, the he LED lights generate light from the complete visible spectrum. The mobius coil generates a collapsing magnetic field, and the machine's Biomat, a thermo-electrotherapeutic device, enhances your immune system by generating far infrared rays and negative ion production. Read more here. Slim, tighten and tone with Cryo and its body-contouring effects. CryoSlimming uses thermoelectric cooling to freeze fat, causing the cell death of subcutaneous fat tissue without damage to the overlying skin. The 28-minute treatment begins with 4 minutes of heat at 40 degrees Celsius then 24 minutes cold at -8 degrees Celsius divided evenly across the treated areas. The destroyed cells then pass naturally through your body's lymphatic system. CryoToning helps diminish the appearance of cellulite, fine lines, and wrinkles. The 20-minute treatment applies only cold therapy at -2 degrees Celsius , causing local metabolism and microcirculation to improve in the treated area. This boosts your production of collagen which eliminates cellulite, tones the area, improves skin elasticity, and reduces pore size. Flatiron’s Modrn Sanctuary is a luxury wellness center which acts as an urban getaway for uniquely specialized treatments for health, wellness and beauty that range from traditional medical practices to alternative ones. Founded by leading NYC hypnotherapist Alexandra Janelli, the center houses an elite team of practitioners. The initiative is taking place throughout NYFW, from September 6th to 13th. Modrn Sanctuary is located at 12 W 27th St, New York. Bookings must be made through anabel@tpof.team or the form below.